NEW YORK, NY--(Marketwired - Oct 14, 2013) - When visitors arrive at the city that never sleeps, they don't lack for things to do. They do, however, need a hotel that puts them in the center of all the action, starting with an onsite bar and restaurant that lives up to the city's reputation. Answering that demand is the Renaissance New York Times Square Hotel and its R Lounge, where sleek style, peerless views, happening events, and crowd-pleasing menus make it a favorite among travelers and locals alike. 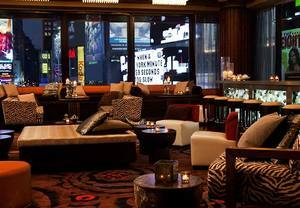 It's not hard to see how R Lounge stands out from other bars in Times Square. Its panoramic views of the area, courtesy of floor-to-ceiling windows, simultaneously integrate guests with the city and remove them from it. Even as the lights and traffic move, guests can relax amid the plush seating and saturated colors of this chic New York City boutique hotel. There is plenty to keep guests pleased, from happy hour and going well on into the night, starting with the food. Bar Bites can be as light as the warm, soft pretzel or as substantial as house-made meatball sliders. A tailored entrée menu features all the favorites (think free-range chicken, risotto and steak), while a seasonal hot chocolate menu is as tempting as it is distinctive. And for guests who like their food simply composed but carefully crafted, R Lounge offers an exclusive Blue Ribbon menu developed by the legendary Bromberg Brothers of New York City's Blue Ribbon Restaurants®. Dishes like the famous Northern Fried Chicken Wings with Blue Ribbon Mexican honey and Smoked Salmon Toast with three-onion cream and capers capture the mouthwatering elegance of comfort food done well. After dessert, a few steps will bring guests into the heart of the city's theater district where they can find shows, bars and clubs for everything from comedy to dancing. But all that can wait, of course, if there's an event happening at R Lounge. This party venue regularly hosts events that let guests take a unique bite out of the Big Apple in Times Square. On October 17, for example, DJ Lox Luther will have the place swaying to the trendiest beats. A few days later on October 22, Gallo Winery will host a tasting, followed by 1800 Silver Tequila on October 29. Quirkier offerings, like the tarot-card reading on October 24, only enhance the vibe of this cultural destination. On holidays, however, this NYC event venue pulls out all the stops. On Halloween, DJ Danny Estrella creates his trademark sultry sounds for the night. And New Year's Eve puts guests in the front row for the biggest party in the world, while they watch first-hand as the Times Square ball momentously drops. Being in the center of it all certainly has its perks. Visitors to New York City want a hotel that offers the style of the big city, the comforts of home and a location that puts them in the center of the scene. At the Renaissance New York Times Square Hotel, travelers get all of that -- and more. Located amidst the energy of NYC's iconic Time Square, this hotel offers an array of amenities including a trendy bar, state-of-the-art fitness center and five fully equipped meeting rooms offering privacy and a professional setting. Featuring a boutique, contemporary look and feel, created by world-renowned designer Jordan Mozer, this hotel is a destination in a city that has more than its fair share of hot spots. The casual R Lounge serves up specialty cocktails, inventive appetizers, breathtaking panoramic views and a calendar full of exciting events; while VIVID Lounge offers all-day dining that includes a delicious breakfast buffet. Guest rooms are chic, simple and spacious, and meet the needs of both business and leisure guests alike. Each room features high-speed Internet access, soundproof windows, 24-hour room service, a moveable desk, luxurious bed, 37-inch LCD TV and coffee/tea service. Business guests are minutes from major banks and corporations, while those on vacation can walk to top attractions including the Empire State Building, Rockefeller Center, Bryant Park, St. Patrick's Cathedral, Central Park and shopping on Madison and Fifth avenues. With panoramic views of Times Square, happy hour cocktails, a full entree menu, and tasty late night bites, R Lounge is sure to please locals and visitors alike. For guests who like their food simply composed but carefully crafted, R Lounge proudly offers an exclusive Blue Ribbon menu developed by the legendary Bromberg Brothers of New York City's Blue Ribbon Restaurants(R).